I’ve gone over how to use the Charactermancer in a previous article. Since its inception, my players and I have used it frequently for our many playtests, one-shots, and whenever else we need to roll up some new characters. We’re all seasoned players of D&D 5e at this point, but the quality of life perks of using the Charactermancer is always worth it to us. Put it this way, you don’t have to manually type in all of your level 1 spells, equipment, etc. you simply click a few buttons and the Charactermancer imports everything for you. It’s awesome. It gives us time to focus on important things, such as finding the goofiest picture possible for your character token. This latest update for the Charactermancer brought two things to Roll20. The first was the addition of one of my favorite D&D 5e books, Xanathar’s Guide to Everything. The second was the long-awaited update to the Charactermancer, Charactermancer Level Up, now allows you to level your character as well as create a fresh level 1 character. Spend less time bookkeeping and more time creating a character. Picture courtesy of Roll20. Anyone can use the 5e SRD for free in the compendium, but you can also purchase most of the D&D 5e sourcebooks to add to yours and your players’ compendiums. 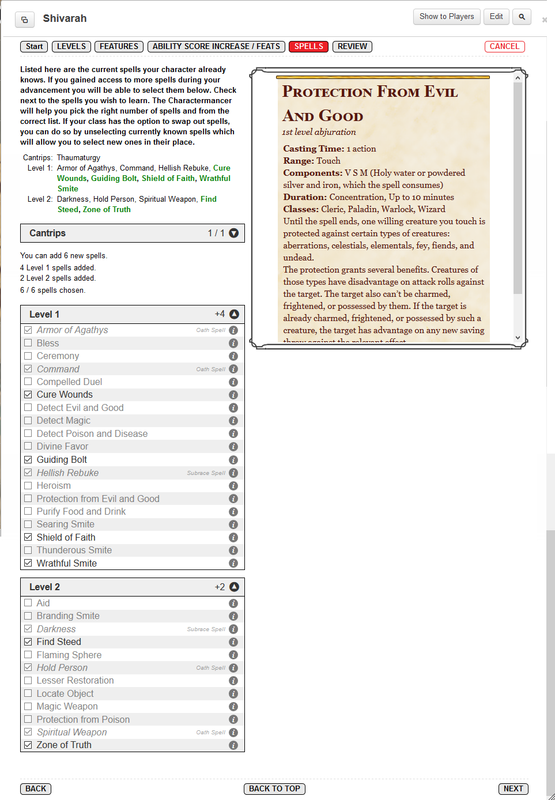 You and your players can use the compendium to drag-and-drop spells into your character sheets, look up rules on the fly, and of course, further automate character creation in the Charactermancer. 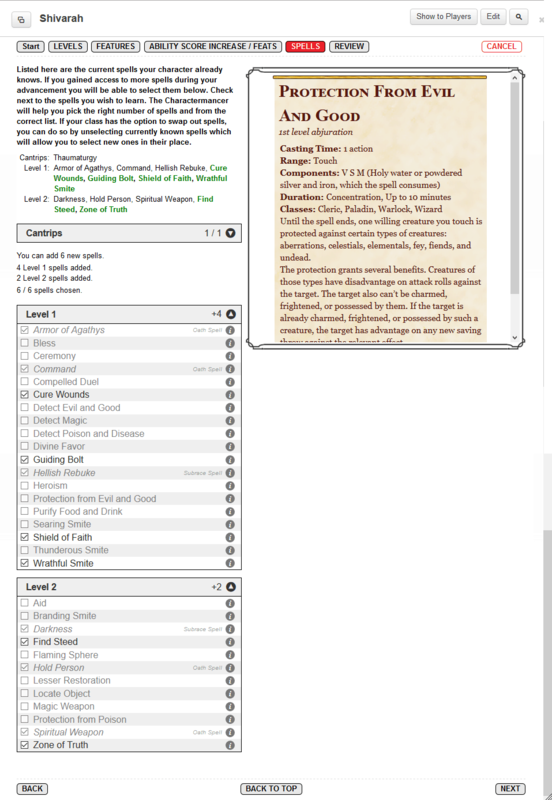 Roll20 provided us with copies of the PHB and XGtE to show how easy it is to use Charactermancer Level Up with the help of an expanded compendium. Only one missing is Sword Coast Adventurer’s Guide which has a large amount of its content reprinted in newer releases. Not to dunk too hard on the book, but it’s not sorely missed in my opinion. It’s expected to share your physical books with your group. Why not share your compendium as well? 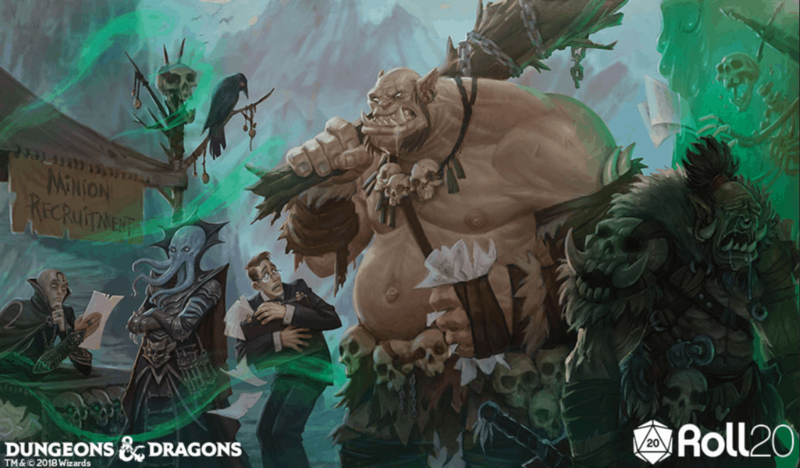 Depending on your Roll20 subscription level, you can share your compendium with up to 5 players (1 game), 30 players (3 games), or 75 players (5 games). This means that really only one Roll20 account needs to have any of the books at one time for all of your friends to enjoy it. You can all pool your money together to buy your DM the books as a gift, but reap the benefits of being able to use the books yourselves. You can unshare your compendium once your group is done with that particular game. 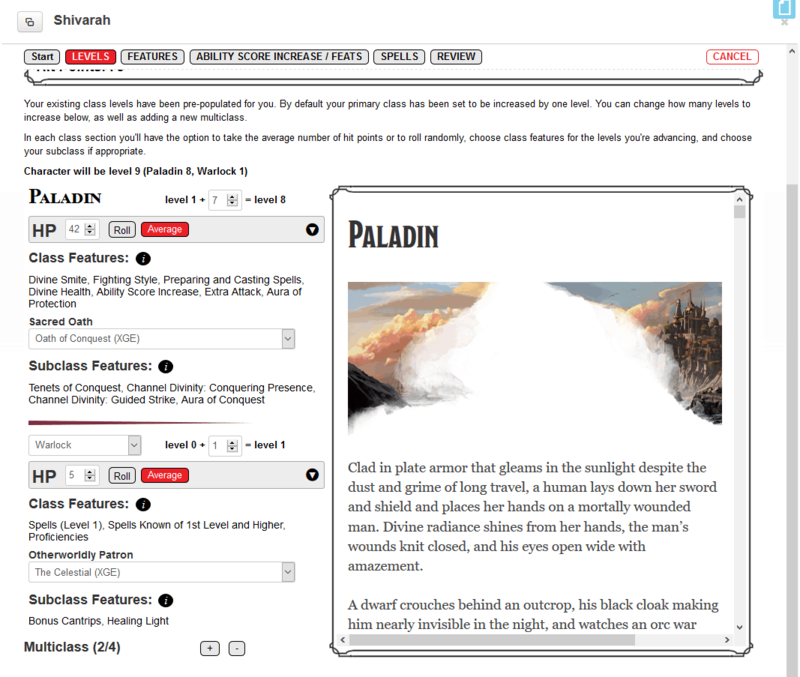 To share your compendium with your players, first, go into your game’s settings. 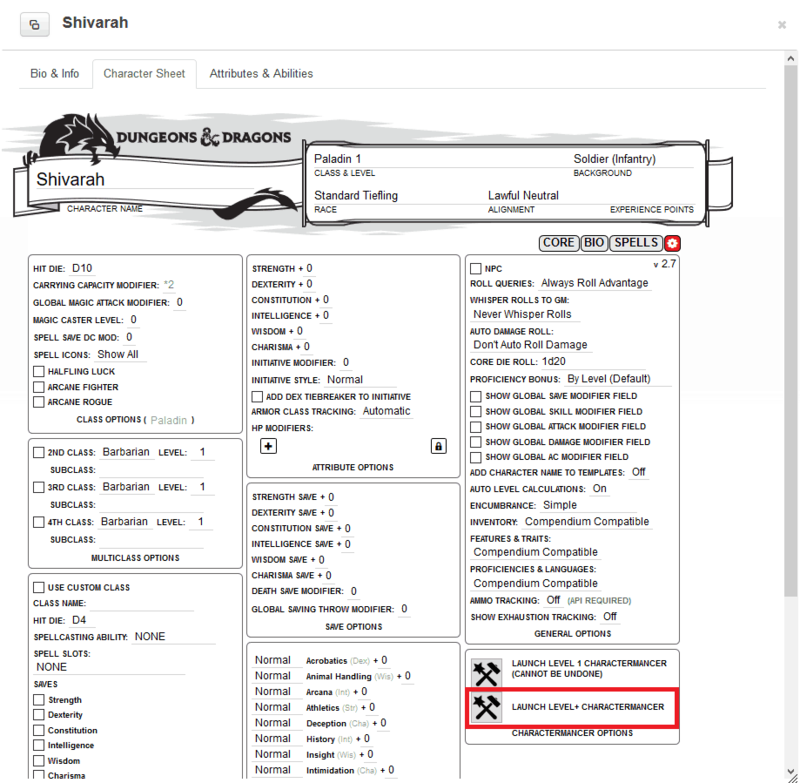 The compendium settings come just before choosing your character sheet template (see above picture for reference). You can then share your compendium with your players by selecting the “Yes” radio button. Now your players can access the same books as you in their individual compendiums! Be wary of which character sheet template you are using. Custom sheets may have some issues with the compendium. I tend to prefer the physical books, but having access to the PHB and XGtE in the compendium has been super helpful. I can just search for a rule or mechanic and quickly reference it during play. You can also do this in your games as long as you have the books in your compendium or have them shared with you in this game. I’ve already written an article about creating a character using the Charactermancer. If you’re interested in creating a character look through that article before continuing! 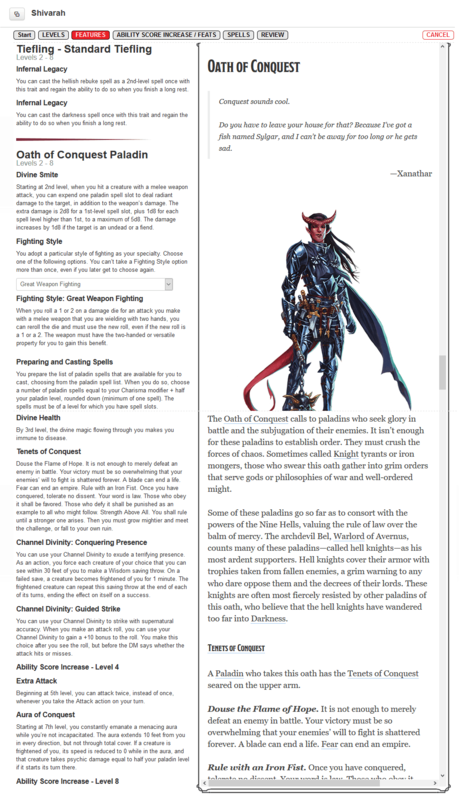 For this article, we’re going to be using Shivarah the Tiefling Paladin yet again, because I still haven’t been able to play her. I’m going to tentatively level her up to level 8 for the adventure I’d like to use her in. This means we’ll see her gain spells, choose an archetype, and spend a couple of ASIs. 2 clicks in your character sheet and you’re ready to go! To begin leveling up your character simply open up your character sheet. Then in the settings menu you’ll click on the “Launch Level+ Charactermancer” button. Use the screenshot above for reference. Click the next button to get started. This is the welcome screen for the Charactermancer Level Up. Like with the character creation feature of the Charactermancer, all of your changes are saved after you click the next button. You can always revisit these changes while you are in the Charactermancer so feel free to play around before you finish your level up. The awesome thing about Charactermancer Level Up is that you can do multiple level ups at once. Initially, I was dreading having to go through the process 7 times. This was a welcomed feature for sure. You can roll for HP and choose your class archetype if you haven’t already. I prefer to take the average HP on a level up so I was glad to see that that was an option as well. 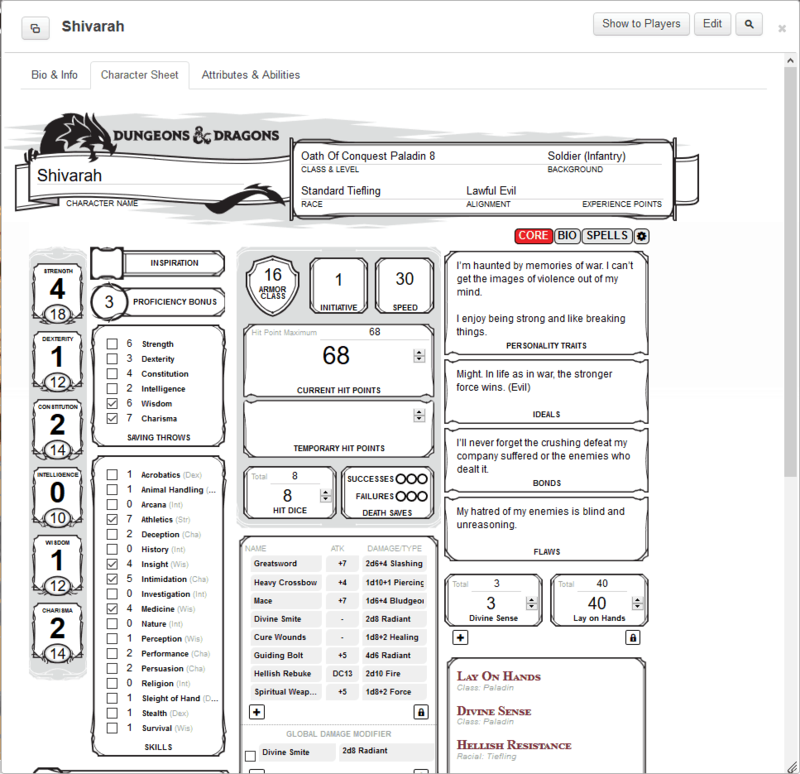 Since Shivarah is a paladin she gets her archetype at level 3 so we’re doing that now. Short, sweet, and to the point. The levels menu gets you on your way immediately. Depending on the books you own in your compendium, you’ll be able to see the relevant information on your primary class on the right-hand side of the screen. This is definitely helpful for new players, or for people playing an unfamiliar class. In this menu, you can also multiclass up to 3 times. You’re a very brave person if that’s not enough classes for you. I’m not actually multiclassing with this character, but for the sake of the article I tried it out. Just like your primary class, you can choose your subclass’ archetypes within this menu and roll their HP. Depending on the class(es) that you chose you may have a few decisions to make in this menu. For the most part though, most of this menu will just contain information on which features you unlocked in this set of levels. As you can see in the picture below, this also includes any racial features that you gain by leveling up. So, in addition to all of my fun paladin features I also gain two spells from my race. Understandably, leveling from 1-8 in one go includes gaining a lot of features. The only choice I had to make in this menu was my class’ Fighting Style. This was done via a drop-down menu. Once you select a feature, the menu updates with that feature’s description below the menu. This is a great menu to spend some time on to familiarize yourself with all of your new features. However, this menu doesn’t have much in terms of decision-making and building out your character. Now we have arrived at one of my favorite parts of leveling up, spending your hard-earned Ability Score Increase (ASI). Your class decision will determine how many and how frequently you earn ASIs. For example, a level 8 Paladin gets 2. This menu is pretty easy to use. You get one window per ASI you have obtained in this set of levels. You can use the +/- buttons to toggle how you’d like to spend your 2 points. These points can both go into one ability score, or you can increase 2 different ability scores by 1. You only get a handful of ASIs throughout the game so choose wisely! You can also opt-out of increasing your ability scores and instead choose a Feat. I had intended to pick up Great Weapon Master at level 8, but the tab to select a Feat was grayed-out. This is a known issue for Charactermancer Level Up according to their release notes. Hopefully that’s fixed soon. For now, I just added both of my ASIs to Strength. I may go back and manually input Great Weapon Master in lieu of one of those later. Last up is the Spells Menu. If your character is purely a martial class you’ll be able to skip right to the Review Menu. Shivarah is not, so it’s time to pick our Level 1 and 2 spells! I’m glad that I didn’t pick a full caster. 8 levels worth of spells at once would be exhausting. As you can see in the picture above, all of my Oath Spells from my Oath of Conquest archetype are already selected and grayed out. My tiefling spells are preselected as well. This is a great little quality of life feature to make sure that you don’t double-up on spells. All of my new spells are colored green in my spells list at the top of the page. The text in the middle section of the window keeps track of how many spells you have left to select which was very helpful. If you click the grey information button next to a spell the window on the right-hand side will open up the spell from its appropriate book in your compendium. This was extremely helpful and probably my favorite feature for both new and veteran players alike. Take all the time you need to choose your new spells. It’s an important decision! This was a very concise menu. I wouldn’t have minded seeing the features and spells we gained as well. The review menu shows you how your character has changed after leveling. 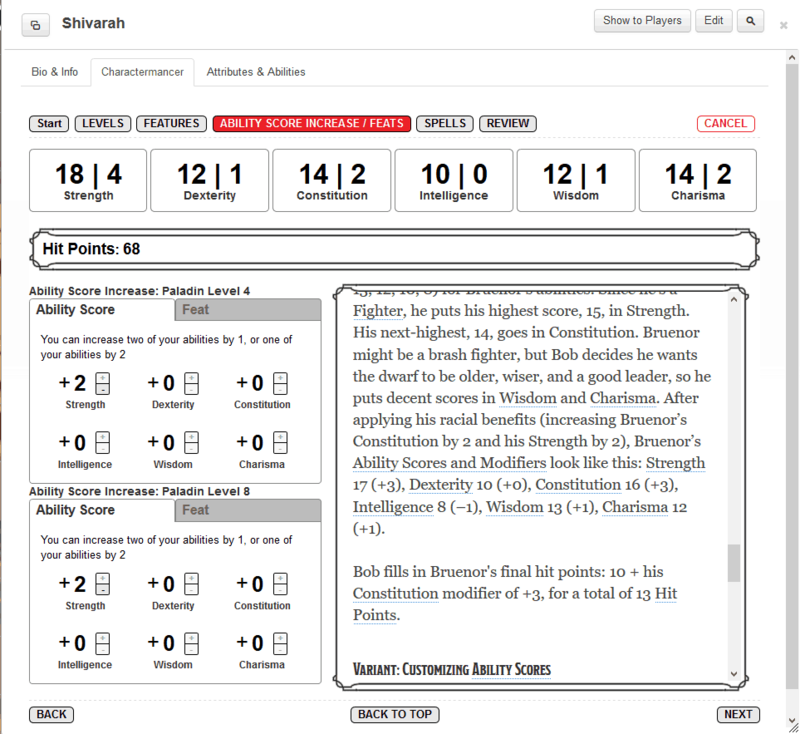 I was surprised that it only showed me the changes to Shivarah’s class, level, HP, and ability scores. It may have been nice to see all of the features and spells that she got in this menu as well, but we can see all that once we hit the “Apply Changes” button and your character sheet will be updated. And there you have it, your character sheet is now all up to date! You can now customize the sheet manually until the next time your character levels up. Don’t worry, all of your changes will be saved even after your next level up. I was already a big fan of the Charactermancer for creating a new level 1 character. 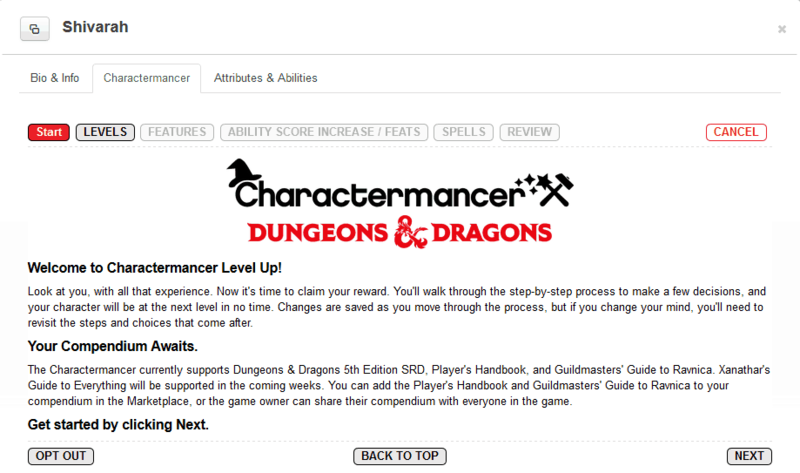 Charactermancer Level Up is another great step in the direction of making character creation and management much more streamlined for Roll20 users. The Charactermancer is worth it to use even if you only have the free 5e SRD in your compendium. You’d have to manually input your class features, spells, and character information that aren’t included in your compendium, but you’ll still save a lot of time. The only gripe I have with Charactermancer Level Up is that it doesn’t let you add a Feat when spending your ASIs. However, Roll20 has taken this issue into account and will fix this in a future update. Despite that, I’ll definitely be using this for my future characters’ level ups. This article is inaccurate. MToF and VGtM are not Charactermancer ready at present. Thanks for the heads-up, I just edited the article to correct that!